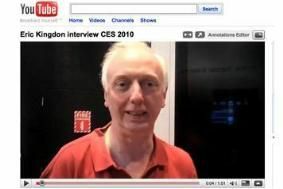 CES 2010: Watch our exclusive video on Sony's new 3D Blu-ray player | What Hi-Fi? Yes, of course it will be able to handle 3D Blu-ray discs, but there's much more to it than that, including multichannel SACD playback, wi-fi, Bravia Internet TV support, DNLA support, access to Twitter, Facebook and other apps and compatibility with Apple's iPhone – a Sony first. Eric explains the thinking behind the new model and describes all its key features in detail. To find out more, watch our exclusive video interview with Eric on our YouTube channel.